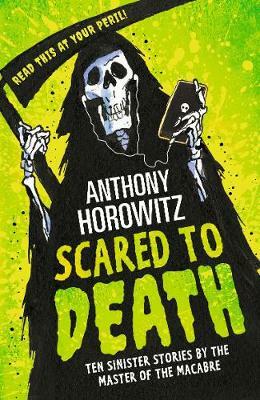 The number one bestselling author of Alex Rider gives horror a whole new look in this mischievous collection of ten twisted tales.This chilling collection of ten nightmarish and fiendishly funny short stories is a perfect read for fearless children. From a train journey straight ... read full description below. The number one bestselling author of Alex Rider gives horror a whole new look in this mischievous collection of ten twisted tales. This chilling collection of ten nightmarish and fiendishly funny short stories is a perfect read for fearless children. From a train journey straight to hell, out of control robots with a murderous streak and even a television show where death is the penalty - these terrifying tales display the dazzling wit and wicked humour of master storyteller Anthony Horowitz, and are guaranteed to make your blood curdle and your spine tingle. Anthony Horowitz is the author of the number one bestselling Alex Rider books and the Power of Five Series. He has enjoyed huge success as a writer for both children and adults. He was invited by the Ian Fleming estate to write the James Bond novel, Trigger Mortis and his most recent novel, Magpie Murders was a Sunday Times bestseller. Anthony also wrote the highly acclaimed Sherlock Holmes novels, The House of Silk and Moriarty. He has won numerous awards, including the Bookseller Association/Nielsen Author of the Year Award, the Children's Book of the Year Award at the British Book Awards, and the Red House Children's Book Award. In 2014 Anthony was awarded an OBE for Services to Literature.